ARTICLE CORRECTION/NOTATION: The Forest Preserve District did not aquire the cemetery in the 1950s. It’s hard to believe that right here in Tinley Park we can lay claim to having what has been called “the most haunted place in Illinois,” not only in our midst but at the very place where our town began. 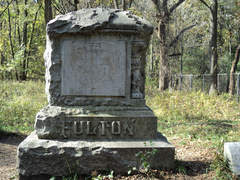 Bachelors Grove Cemetery is located down a trail that was originally a section of the old Midlothian Turnpike. It seems that the cemetery has always been shrouded in mystery, the subject of ghost stories and legends. But before it became a desecrated burial ground and a destination for ghost hunters and adventuresome partiers it was a settlement for immigrants from England, Ireland and Scotland. They arrived in the late 1820s. A second wave of immigrants arriving in the 1840s were primarily of German descent. It is strongly suspected that the name Bachelor was derived from the family Batchelder who resided in the area as early as 1845. It is also the name most commonly found on period documents. There is another theory that claims the settlement was named for a group of single men who settled in the area. Throughout history it has also been known as English Batchelors Grove, Batchelders Grove, Bachelders Grove, Everdon / Everden’s Grove , Schmidt / Smith ‘s Grove and Fulton’s Grove, among other names. The first legal record of the cemetery occurred when Edward Everdon sold his property in the area to Frederick Schmidt in 1864, setting aside one acre of land for use as a graveyard. It has been recorded that the first burial in Everdon’s cemetery was that of Eliza Scott in 1844, although another source lists the earliest burial as that of William B. Nobles in 1838. The most recent burial was that of Robert E. Shields in 1989. The settlement of Batchelors Grove thrived for about 20 years. But when the Rock Island and Pacific Railroad came through southwest Cook County in 1853, most of the residents of Batchelors Grove moved south to the nearest rail station in Bremen. Older residents have said that at the time the cemetery was still lovely to visit, much like a park . In the 1950s the Cook County Forest Preserve District took possession of the cemetery. Newspaper articles of the time state that the cemetery was not maintained regularly and eventually became overgrown and abandoned. This seems to be when the vandalism and ghost stories began. Bachelors Grove has long been called the most haunted place in Chicagoland. One of the most commonly told tales is the sighting of a pale blue orb that hovers over the tombstones. Another is of a lighted farmhouse with a porch and swing that appears and disappears. There have been many reported sightings of cars on Midlothian Turnpike that appear out of nowhere causing drivers to swerve out of the way only to vanish into thin air. There is a pond next to the cemetery that is reported to have been the dumping grounds for the victims of Chicago gangsters. The pond is also said to be haunted by the ghost of a farmer on a plow being pulled by his horse and a huge two-headed man. We can’t forget the “Madonna” of Bachelors Grove, also known as the white lady or Mrs. Rogers. Legend has it she is the ghost of a woman who wanders aimlessly with her infant wrapped in her arms. Vandalism to the cemetery seemed to peak in the 1970s when many of the stones were maliciously broken, defaced, spray painted and stolen. Throughout the years there has been evidence of satanic rituals and attempts at grave robberies. The desecration of the cemetery continues today, although there is not much left to destroy. Today Bachelors Grove cemetery has become a mere ghost of itself. It is rich with tales and legends that make it a fascinating draw for many people, but it is also rich in the historic beginnings of Tinley Park. I’m sure that those early pioneers could never have imagined that their settlement would be remembered for its haunted cemetery instead of establishing the roots of one of the most thriving communities in Illinois today. You can learn more about Bachelors Grove cemetery at the Tinley Park Historical Society, located at 6727 174th St.